Single bowl hand fabricated 20 gauge dual mount sink. Faucet ledge has 3 hole faucet drilling. Sink may be installed above or below counter. Rear drain for more storage below. Bowl sloped to the center of the waste hole and drain lines for efficient draining. Commercial satin finish is a lovely complement to commercial look appliances, and easy to maintain. 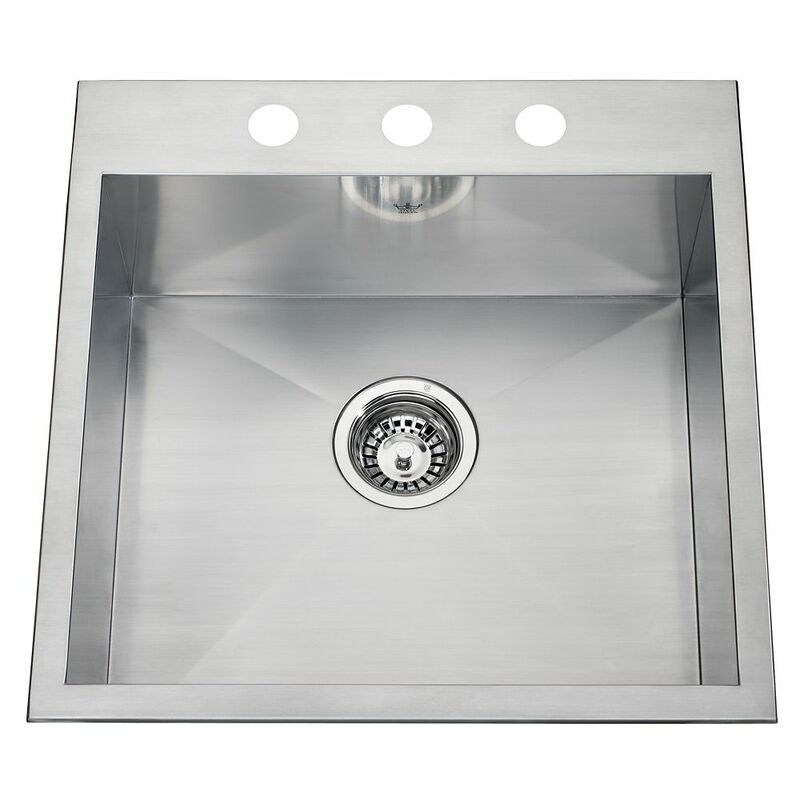 Kindred Combination LH 20 Ga sink 3 hole drilling - 20-1/2" X 31-1/4" X 8"
Kindred Combination RH UM 20 Ga sink - 21-1/2" X 32-7/8" X 8"
Oversized two bowl undermount 20 gauge sink with small bowl right hand position. Main bowl dimensions can handle even large roasters and stock pots with ease. Sink features hard wearing satin finished bowls, sparkling mirror finished rim, Spillway<sup></sup> partition between bowls to prevent water on the counter, and included waste fittings. Rear drain positions afford more storage below the counter. Quality assured with the standard Kindred Limited Lifetime warranty. Large, single bowl 20 gauge topmount sink with faucet ledge and 1 hole faucet drilling. Sink features hard wearing satin finished bowl, sparkling mirror finished rim, and included waste fitting. Quality assured with the standard Kindred Limited Lifetime warranty. A wonderful main sink, or a practical secondary sink for big clean up jobs. 20 Ga HandFab DM single sink 3 hole drilling Single bowl hand fabricated 20 gauge dual mount sink. Faucet ledge has 3 hole faucet drilling. Sink may be installed above or below counter. Rear drain for more storage below. Bowl sloped to the center of the waste hole and drain lines for efficient draining. Commercial satin finish is a lovely complement to commercial look appliances, and easy to maintain.